Silverlight Spy 3 was just released. I think you’ll want this in your tool bag right away. Why? Because it is a great way of seeing what’s going on in your Silverlight application … and twiddling its appearance … at runtime. It is especially helpful if you’re building a compositional application of many, independently-designed views; you want to see them playing together and understand what’s happening. I’m looking at my Prism Explorer demonstration app right now. This demo shows our DevForce Silverlight Data Services product working with Prism. Fired it up in Visual Studio (to get the Cassini server side going), then pasted the URL (http: //localhost:9006/) into Spy’s address bar. Spy fires up the client in its browser just fine. Spy drew the red highlight box, not me. I held down the ctrl + shift keys and moved my mouse around the browsed page; as I did, Spy highlighted each element in this manner; and then I clicked on the address to set the focus as you see it. 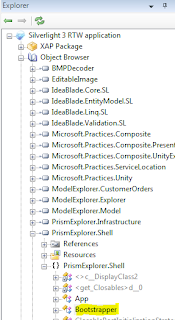 Now I swing over to the Explorer view and I see that the address is a TextBlock in the middle of a DataGridCell … deep in the visual (or logical) tree that begins with my Prism shell. I love being able to start from something I see on the page right to the element in the object tree. I get the same effect in the other direction by navigating from the tree: select a node and watch Spy highlight the corresponding visual real estate in its browser. Peeking and tweaking the look on the fly is value that can hardly be overstated especially in a composite app. Sometimes you just have to see the app run in a production context with real data behind it to understand what is going on. Adjusting some values to visualize how it might look after correction … that’s worth something to me. I can also spy on other people’s applications. Now, when I see an effect I like, I’ll have a fighting chance to figure out how it’s done. Nothing evil in that. Perhaps more productively, Spy can help me better support my customers. I don’t have their code. I don’t want their code! Now I can fire up their app in Spy from out here in Stinson Beach (yes, kicking back with the blog) and gain immediate insight. Having reflector baked in makes it easy to walk their code too. Spy let’s me monitor mouse and key events which I can filter. In this snapshot, clicking on the event also takes me to the associated visual element. The top window is a grid of the traffic; double clicking a row reveals the headers panels in the lower half. There’s a Performance Monitor with the visual familiarity of the one in Windows Task Manager. 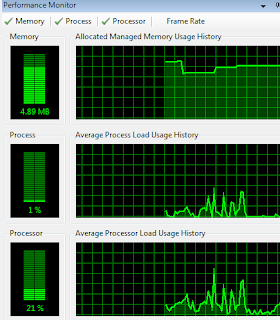 The processor metric seems parallel to the Task Manager’s. The memory metric probably tracks just your app’s usage although how and how precisely I can’t tell. I noticed unpredictable figures simply by refreshing the application address to restart the app. I think of it as a rough gauge of relative behavior. You’ll get a general feel and you might be able to detect some memory leaks this way. There are other goodies. These are just the features that attracted my immediate attention and made me want to buy. Spy was free in earlier incarnations. It now sells for roughly US$100 for a personal copy. You can download an evaluation copy that’s good for 27 days. Frankly, I’m glad to see a price. I love “free” as much as the next guy but nothing is truly free. I want Spy’s author to keep improving this tool and he has to make a living at it to do it well. I’m bummed when a great free tool comes along and then it just sits there, waiting upon the author’s free time to answer questions, fix bugs, and take the next giant leap. The biggest shortfall (as I will repeat) is the utter absence of documentation. With a little dough, Koen Zwikstra - the man behind spy - can afford to hire a tech writer and cut some videos. Full disclosure: I got a free copy as an MVP. This review, however, is entirely my idea with no promise of reward. Silverlight Spy 3 is a super tool and a fine piece of work. Runs like a top. No install issues, no runtime glitches so far. No documentation! None that I could find. This is a huge weakness. Thank goodness for Koen’s Channel 9 video with Adam Kinney recorded at MIX in March 2009; it opened my eyes to the potential and gave me valuable operating clues. How else would I discover “Ctrl+Shift+Mouse+Click”? Web search revealed nothing else (there is material on Spy 2). Fortunately, it is pretty intuitive. Just bang around on it awhile and it starts to make sense. But some kind of guide needs to come out soon. I’m hopeful this introduction piques your interest and gets you started. A few minutes with Spy and you remember in a hurry never to put anything secret in your Silverlight client; that’s the wrong place for the Coca Cola recipe. Sure other tools can do it …. but Spy makes it so easy. Excellent review Ward. I hope Koen takes on board the lack of documentation criticism as I think this is the biggest impediment to its wider take-up. If you haven't got around to watching the C9 video (which is effectively the only form of documentation there is) you wouldn't know about key functionality like the CTRL+SHIFT combination. As you say, it's a great tool and as someone who paid for it, I too am glad the author has decided to charge for it. The price is more than reasonable and Spy has been a life-saver for me on a couple of projects. Blog entries like this will hopefully help spread the word amongst the Silverlight community. [color=#f5deb3]Музыкальный ансамбль [url=http://dejavu-group.ru/svadba.php]Deja Vu[/url] - это коллектив заслуженных вокалистов и музыкантов. [url=http://dejavu-group.ru/index.php]Deja Vu[/url]- лидер в области организации и проведения праздников, дней рождения, шоу-программ, копроративов, торжеств и дней рождения. В репертуаре группы Дежа вю более 3000 песен. ВИА Dejavu-group располагает мощной качественной музыкальной аппаратурой, позволяющей наполнить приятным и плотным уху звуком как небольшое помещение (фуршет), так и большое помещение (корпоратив до 1 тыс. человек). Подумали с мужем о гостинцах на Новый год ребенку, ему 3 года, всевозможные-пылесборники-конструкторы у него есть предостаточно, он любит мышонка Тич. Я откапала типа подобной игрушки, только медведя http://www.sweetwear.ru/video1.php , кто нить покупал такого? Стоит покупать? Или порекомендуйте что-либо ещё. Не дайте ребенку остаться без презента от ДедаМороза. Cool article you got here. I'd like to read something more concerning that matter. The only thing this blog needs is some pics of such devices as gps jammer. [color=#f5deb3]ВИА [url=http://dejavu-group.ru/svadba.php]Дежа вю[/url] - это коллектив заслуженных вокалистов и музыкантов на праздник. [url=http://dejavu-group.ru/index.php]Дежа вю[/url]- законодатель в области организации и проведения корпоративных вечеринок, свадеб, торжеств, шоу программ, музыкальных вечеров. В репертуаре музыкальной группы Дежа вю около 3 тыс. произведений. Музыкальный ансамбль Deja Vu располагает мощной качественной музыкальной аппаратурой, позволяющей наполнить приятным уху звуком как небольшое помещение (фуршет), так и огромное пространство (корпоратив до 1000 человек). пршьу прощения за опечатки.... очень маленькая клавиатура у PDA! После вселенской катастрофы Америка превратилась в мертвую пустыню. По бескрайним дорогам, кишащим бандами, с враждой поражденной войной за воду и еду, путешествует мудрый Илай. Однажды он попадает в мрачные земли, где когда-то находился прекрасный штат Калифорния, а теперь это сущий ад, где бесчинствует тиран Карнеги.